When all else fails – trench composting is the answer! Nothing can quite build soil fertility like compost. The trouble is, not everyone has room for a compost bin or barrel. And that is where today’s gardening tip from Vicky Bolander, from Mississippi works beautifully! Kitchen scraps are perfect for trench composting. Vicky lives in an urban area, and with a small backyard, has always found it troublesome to find the space for a large compost bin or barrel. So, she practices the age-old art of trench composting. Trench composting dates back centuries. Native Americans used to bury fish heads and scraps in the soil prior to planting their corn crops. As the remnants decomposed, they gave back valuable nutrients to the soil. This in turn helped to fertilize and provide strength to the corn crop. As you will see below, it works the same way today for gardeners like Vicky. I think one of the things we enjoyed most about Vicky’s story is how the concept has been passed down through the generations. If you have a gardening tip to share with our readers – what’s holding you back? Check at the end of the article to see how you can share your tip with fellow TIMG Readers. It’s easy to do, and can help keep alive the traditions of gardening! Now lets take a look at Vicky’s tip. I am not fortunate enough to have much of a backyard. In fact, I am not fortunate to have very much of a yard at all. I have lived most of my adult life in a small suburban neighborhood near Biloxi, Mississippi. Even though we are limited by space, my husband and I have always tried to grow as much food as we can. We have a small 10 x 20 garden space in the back that we fill with as many plants as we can. Tomatoes, peppers, potatoes, beans, okra, and a big assortment of greens are our favorites to grow. We also grow in pots in our front yard and on our back porch. We even use our side fence to grow a lot of pole beans. It must be a perfect spot for them, because they grow wild every summer. I learned the art of trench composting from my grandmother. My mother never really enjoyed gardening, but when I was a child, I would spend a lot of my summer days under the care of my grandmother. She loved her backyard garden. She raised a few chickens and even rabbits. But her pride and joy was what she could grow in her little garden. One of my chores every morning was to head out to the garden and dig a hole to throw that morning’s breakfast leftovers away. Everything from the coffee grounds from the percolator, to egg shells or potato skins. I dug a little hole and buried it in the soil in the garden. We didn’t have a fancy compost bin back then, nor do we now. But those scraps broke down and helped replenish the earth. She used to always say, “what we take out, we have to give back.” I didn’t understand it then, but I do now. I do the same still today. And over the years, it has really helped my garden soil to stay healthy and fertile. It takes only seconds to do, and it really has made a difference. 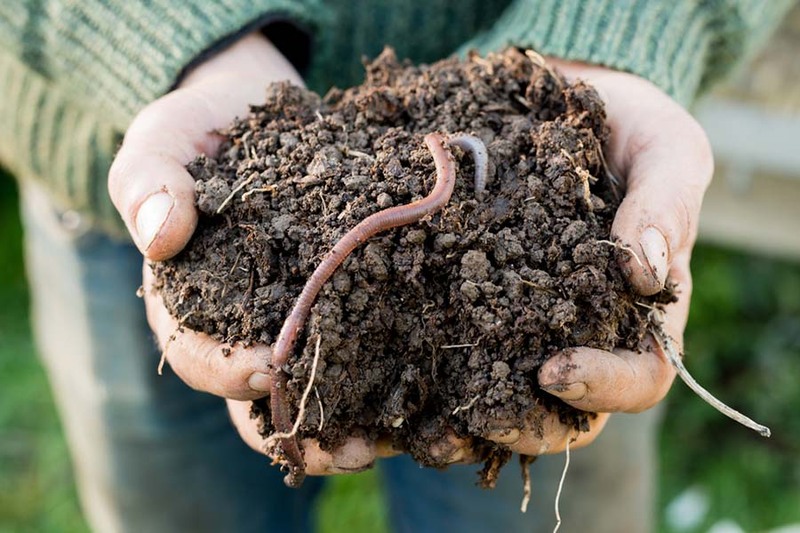 Trench composting encourages worm activity as well – always good for the garden! I dig down about 6 to 8″ with a shovel and place whatever we have as scraps in to the hole. Next, I use the tip of the shovel to chop up the stuff a little more while it’s in the hole. Then I just fill back in with the dirt. Someday’s it might be a few egg shells and coffee grounds like the old days with my grandmother. Other days, it might be banana or orange peels. Just whatever we have used. When the garden had been planted or has been growing, I select an area that is a few inches away from the plants. I try to place each hole in a different row or different area of the garden each day. This way, it spreads the goodness around. We always have lot’s of worms in our soil, and I think it is from all of the scraps that they get. We want to know how you grow your favorite flowers, shrubs, trees, vegetables and more! Help make This Is My Garden the best garden site around and share your garden knowledge with fellow gardeners! What a great concept. I have a compost pile but I am going to try this too. It might end up being a lot less work. Thanks for sharing.